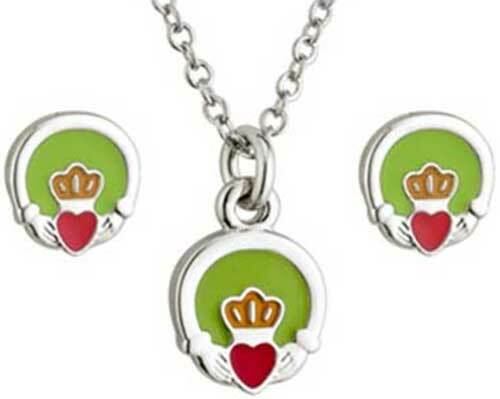 Irish jewelry set features a child size Claddagh necklace along with Claddagh stud earrings. This child's Irish jewelry set is made by Solvar Jewelry in Dublin, Ireland and it is gift boxed with a Claddagh history card, complements of The Irish Gift House. Child's Irish necklace features the Claddagh with a rhodium plated finish along with a colorful enamel accenting. Irish stud earrings feature child size Claddagh icons with a rhodium plated finish along with colorful enamel accenting. Irish baby necklace features a sterling silver Claddagh. Claddagh earrings are sterling silver studs that are an ideal size for an Irish baby or child. Claddagh necklace features a silver plated finish and it is an ideal size for a baby or child. Claddagh stud earrings feature a silver plated finish and are an ideal size for a baby or child.